Prescription costs can hit you where it hurts most! Nobody enjoys picking up a prescription and being handed an enormous bill that leaves you digging in your car seats for change to make it until the next pay day. Obtain your FREE RX card that enrolls you in the Points of Care Savings Program that has provided millions of dollars in savings on prescription drugs for its members. In fact, by using the Points of Care Cash Savings Card, you will save an average of 20% off your prescription medication. Most of your prescription cash savings will fall between 10% and 50%! Unfortunately, patients continue to see the costs of prescription drugs on the rise in the United States. From 2008 through 2014, average prices for the most commonly used brand-name drugs jumped more than 125 percent, according to a report from Express Scripts Holding Co. The factors involved can range from a lack of drug supply to research costs. Most people will need some type of medicine during their life for various ailments, but you shouldn’t have to pay an arm and a leg for it. Some medications can run patients more than $100,000 to complete treatments for different diseases. These numbers are not affordable for most people. No generic version is available as an alternative to high-end medicine. Development and research of new drugs is expensive and can take years to get approved. For rare conditions, drugmakers are setting prices high to offset their costs to treat fewer patients. The U.S. government doesn’t regulate prices like most countries. The Alliance wants to help you offset some of the costs of your prescriptions. Through the Points of Care Prescription Discount Program, millions of dollars in savings have been provided for its members. Using this card can save you up to 40 percent off your medications. This program is free to sign up for and it is free to use. There is no fee and the card can be used over and over. 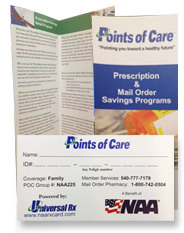 The Points of Care card can be used at more than 55,000 participating pharmacies across the U.S. You can get your card today by visiting www.naalife.com/prescription-rx-card/. Share it with your friends and family to help them out too.